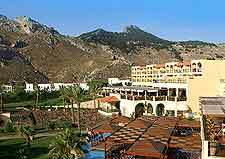 A large number of holiday makers staying on this Greek island choose hotels based in Rhodes Town itself, with the best selection of accommodation to be found within the characterful, Old Town district itself. 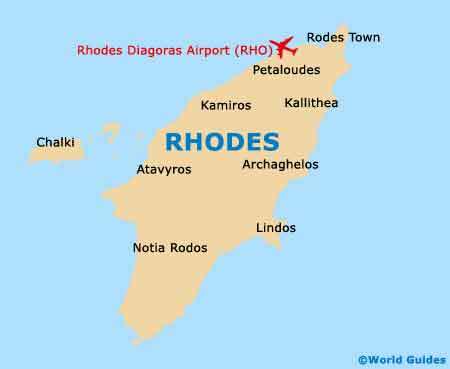 This area of Rhodes Town tends to offer a good choice of well-priced hotels, with appealing accommodation often tucked away along peaceful back streets. With views stretching far across the Old Town, the Pension Andreas is one boutique hotel that comes highly recommended and is located on the Omirou. 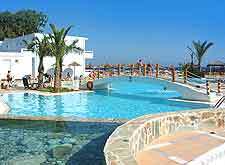 The Best Western Hotel Plaza on Leroy Lochou Street is another popular and well-placed choice in Rhodes Town and is just a stroll from the medieval walls on the Old Town and Mandraki Marina. The New Town area of Rhodes Town is also worth considering as a place to stay, although it has to be said that much of the lodging here is rather plain and lacking in character. Some of the best choices in the New Town include both the Hotel Anastasia on the Oktovriou, and the New Village Inn on the Konstantopedos. With so much sunshine and so many beaches on offer all over Rhodes, may families holidaying here prefer to looking for more resort-style hotels or self-catering apartments, and the island certainly won't disappoint on that front. However, do bear in mind that the accommodation options during the winter months will be more limited, with many hotels choosing to close for this quiet period and not reopening again until early April at the soonest. Good beachfront hotels are never hard to find on Rhodes and several for possible consideration may include the Rodos Palladium next to Kalithea Beach, the Belvedere Beach Hotel in Rhodes Town, just a short stroll from the town centre and right next to Kanari Beach, which can be reached via a handy underpass, beneath the actual road. Lindos is without doubt the number two tourist destination after Rhodes Town itself and a choice of hotels are clustered around the village's Mandraki Harbour and beachfront. 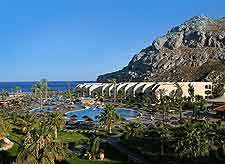 Budget accommodation in Lindos is very limited, although both the Pension Electra and the Filoxenia Guesthouse are cheap. Further lodging lies in western Rhodes, around the lively resorts of Ixia, Kremasti and Trianda, while directly south of Lindos, Gennadi is a reasonable choice and home to the very noteworthy Effie's Dream Apartments.